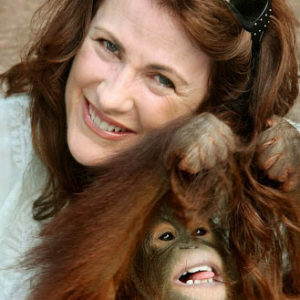 With more than 25 years experience in television and radio, it was during her four years on morning television, that Kim was drawn to the plight of the orangutans, when she was asked to shoot a documentary with friend and former OFI Australia board member, Stephen Van Mil. After finishing school Kim headed for university in Queensland, but deferred her journalism course when she was offered a cadetship in radio. She spent 2 ½ years covering the Fitzgerald Inquiry into police corruption and the demise of then premier Sir Joh Bjelke-Peterson, along with countless rapes, fires, murders, deaths and pillages. She returned to television in her early 20’s working as a news reporter at Channel 7 in Brisbane where she also co-anchored the weekend news with Garry Wilkinson. Kim also hosted a weekly job show and won a coveted spot on 7’s commentary team for 1992 Barcelona Olympics in Spain. After 5 years, Kim moved to Channel 9 in Sydney, and the top rating MONEY show. She spent 6 years on the show and nearly 11 years at the network, hosting weekend news, 11am National news, Good Medicine, Australia’s Most Wanted .. and regularly filling in as co-host on the Today Show. Kim briefly returned to Channel 7 when offered her “dream job” on science and technology show Beyond Tomorrow, but the traveling proved too difficult with her three young children, so Kim moved her young family to Melbourne and accepted an offer to co-host 9am with David and Kim on Network 10. Kim says, “The experience changed me, profoundly. There I was holding these baby orangutans, thinking of my kids at home and just crying my eyes out. Then, the orphaned orangutan I was holding, gently wiped away my tears, just as naturally as human child might do! That was it! I was hooked”. In addition to the documentary Saving Orangutans which screened on the Ten Network and now Foxtel, Kim also produced a series of reports on Borneo’s Orangutans which aired on her show. She also fronted Melbourne Zoo’s Don’t Palm Us off Campaign, which called for changes to food labeling laws in Australia. She also strongly supported Senator Nick Xenophon’s Truth in Labelling bill, which passed through the Senate, only to be bogged down in the House of Representatives. Kim also attended the Senate public enquiry into food labeling, and continues to support the great work being done by Melbourne Zoo to educate and inform the public on the plight of these great apes. Kim left morning television in 2009 to focus on her family. She’s married with three daughters, 2 dogs, 8 chickens, 10 fish, 3 stick insects, a cat .. and a whole lot of adopted orangutans…!